Asian Bowls are my answer to an easy, delicious, make-ahead dinner. You can mix and match the ingredients however you like — and it’s always amazing. This post may contain affiliate links which provide a means for me to earn fees linking to Amazon and other affiliate sites. A few months ago my friend Jessika and her family were visiting for a few days. Needless to say, with an extra three people every meal needed to feed a crowd. Moms wanted to visit, but kids wanted to eat, so we cooked. And had a blast. As Providence would have it, the weather didn’t cooperate with my meal plan one night. And it turned into one of the happiest accidents of my life! I had hoped to make Summer Rolls which are amazing — except in the high heat and humidity of summer. I know from experience that Summer Rolls are not amazing when it’s too hot and humid; they disintegrate. I had all the ingredients, so we made deconstructed summer rolls instead. Turns out this is a meal Jess and her family have often, but they call them Asian Bowls. And this is the moment that Carrot Ginger Dressing entered my life. Now, I love Summer Rolls with a fierce passion, but I may never make them again since I love Asian Bowls so much. I mean, SO MUCH. It’s all the fresh, crunchy goodness with less work! Plus, you can assemble these Asian Bowls days in advance and enjoy them whenever or wherever you like. No matter the weather. I’ve put them on weekly rotation at our house, and always try to make extra ingredients so that I can assemble extra Asian Bowls to enjoy for my lunches. They are amazing dolloped with generous amounts of Carrot Ginger Dressing and a drizzle of sriracha. Yum-O! 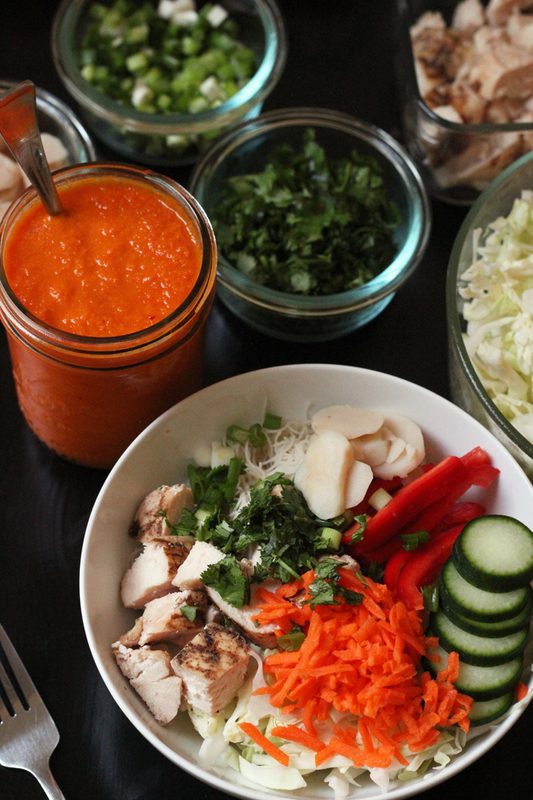 Making an Asian noodle bowl is easy! You want to season and cook your chicken. You can do this on an outdoor grill or an grill pan inside. 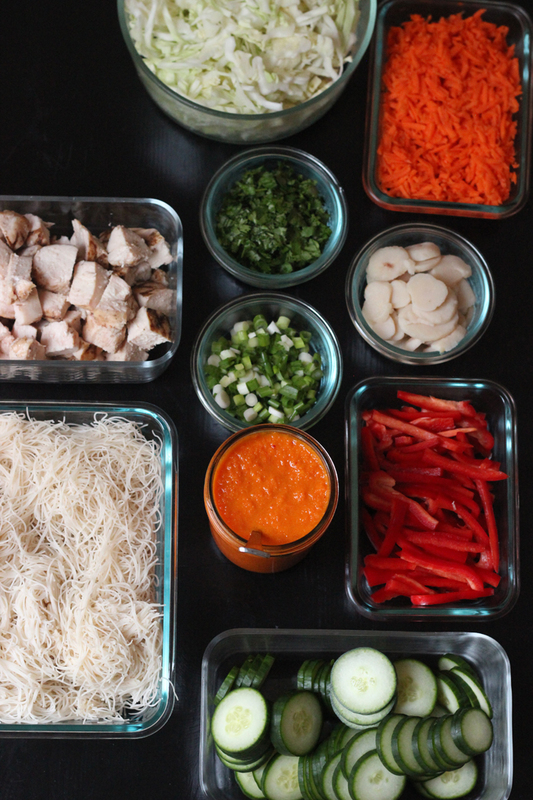 While the chicken is cooking you can assemble your Asian bowl ingredients: noodles, cabbage, carrots, water chestnuts, bell pepper, cucumber, scallions, cilantro, and sauces. The best part? You can allow your family, friends, or whoever is dining with you to assemble their own bowls. And leftovers should be good in the refrigerator, covered, for up to 4 days. 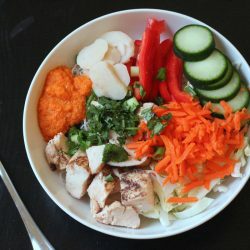 You can use whatever ingredients you like in your Asian Bowls, but I’ve narrowed it down to this amazing round-up: grilled chicken, rice noodles (or rice), shredded cabbage, sliced cucumber, julienned red pepper, sliced water chestnuts, chopped scallions and cilantro, and shredded carrots. Don’t forget the Carrot Ginger Dressing and the sriracha. Stock up on ingredients when they are on sale. Instead of paying full price, buy more than you need when you see it on sale. Then you always have it when you want it. I found a great deal on brown rice noodles (aka maifun; also affiliate link <–) and bought a full case (six boxes). Shop the stores that have the best prices. When I did my big grocery store showdown, I learned that ALDI and Costco have the best prices for a lot of the things I buy. I regularly stock up on chicken and vegetables at ALDI now so that I always have what I need to make Asian Bowls. food processor or Vitamix — to make the dressing. Asian Bowls are my answer to an easy, delicious, make-ahead dinner. You can mix and match the ingredients however you like -- and it's always amazing. Heat an outdoor grill or grill pan. Season the chicken generously with salt, pepper, and garlic powder. Grill the chicken until cooked through and the juices run clear. Allow the chicken to rest until cool enough to handle. Chop the chicken into bite-sized pieces. 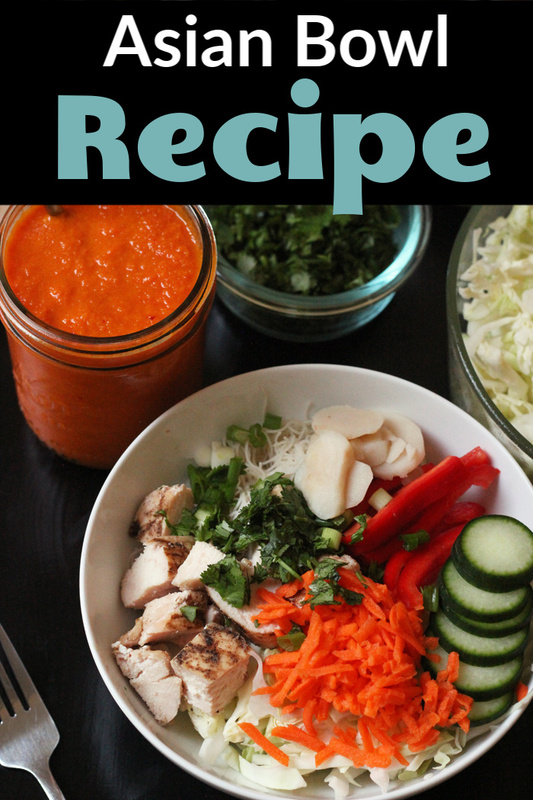 Assemble all the Asian Bowl ingredients: chicken, noodles, cabbage, carrots, water chestnuts, bell pepper, cucumber, scallions, cilantro, and sauces. Allow diners to assemble their own bowls. Leftovers should be good in the refrigerator, covered, for up to 4 days. Have you or any reader found water chestnuts that are grown in the US? I’ve been trying eat more locally and buying something that has been literally shipped across the world is just less appealing. I love this idea and will be putting it on the menu this week! I’ve been busy trying to find affordable water chestnuts, I haven’t really considered where they’re coming from. :/ Sorry. You might try substituting something else crunchy, maybe jicama. It is crunchy without the strong flavor that something like radish would add. That’s a great idea! I’ll try jicama. Looks yummy; I’ll be trying this soon since fall seems to be shy about making an appearance. A variety we like: sub water chestnuts, scallions, and chicken with sugar snap peas, mint, and shrimp. Make dressing of 4 tbls lime juice, 3 tbls fish sauce, and 4 tsps chili-garlic sauce. this looks delicious. I think it would made a delicious soup as well assemble exactly the same omit the dressing and add boiling hot miso ginger flavored broth. cover with a heavy plate for a couple minutes top with scallions soy sauce and a dash of hot sauce.